This major, new book is a complete, easily accessed and highly illustrated guide to diagnosis in Chinese Medicine. Emphasis is placed on “real world” issues and symptoms, and the text focuses on clear interpretations of signs and symptoms – the practice beyond the theory. Since Chinese medicine diagnosis relies on a subjective appraisal of the patient’s symptoms and signs – which form a pattern – many factors beyond traditional Western symptoms are taken into consideration e.g. a patient’s voice, the absence of thirst, feeling hot or cold, the patient’s smell, tone of voice, glitter of eyes. Thus, Chinese diagnosis is based on a subtle appraisal of a patient’s disharmony, which may not be a “disease” at all, and as such requires careful interpretation of a range of nuances. This book will help lead students and practitioners through basic on to sophisticated levels of diagnostic interpretation. Written by a leader in the field of Chinese medicine provides you with an expert’s clinical experience and understanding. NEW! Clinical and Treatments notes provide practical information on acupuncture – including herbal treatment, when appropriate – for most symptoms and signs, giving the book a clinical application in therapy. Articulated and precise, the text by Giovanni Maciocia maps out for the inexperienced reader a safe path through clinical symptoms and signs; for those who are experts in the art, it is a most useful manual for consultation. This book is indispensable both for students and for practitioners of all levels. Diagnosis in Chinese Medicine represents the most comprehensive and yet encyclopaedic and detailed textbook on diagnosis in English. In his usual style combining clarity, precision and experience, Giovanni Maciocia has filled an important gap in the TCM literature. 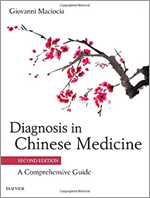 This precise, clear, academic and detailed textbook on Chinese Diagnosis is an indispensable tool both for practitioners and students. Maciocia has consistently provided the West with precise knowledge and profound clarity concerning Eastern medicine. This new work continues his unique scholar-practitioner tradition of teaching and writing that simultaneously supplies immediately practical information with direct clinical application with theoretical insight and wisdom that makes one consider and ponder and see the Eastern tradition from new perspectives. This is an invaluable addition to what can only be described as the ongoing Maciocia transmission. This new book on diagnosis brilliantly fills a gap in the existing literature. It appears encyclopedic yet is surprisingly useful in daily practice. While it is solidly based on Chinese medicine, this book guides the reader in applying the principles of traditional diagnosis to present-day western patients. Physician acupuncturists will especially appreciate the book’s easy access to discover the significance of symptoms and signs they encounter in their practices. It’s a remarkably good book. Diagnosis in Chinese Medicine is an indispensable tool for the interpretation of symptoms and signs. It is the first text that helps the practitioner to understand the significance of symptoms and signs making diagnosis and treatment strategies easier and more logical. For the last 16 years Giovanni Maciocia has been the one author in the field of oriental medicine whose books have become the essential study and practice texts for an entire generation in the west. With this long-awaited comprehensive book on diagnosis and differentiation of symptoms, he adds to this impressive body of work and no student or practitioner will want to be without it. This book is an essential clinical reference for all practitioners and it is surely the most important book on Chinese medicine to be published in the last ten years.